North American Paleontology:The word “Carboniferous” comes from the Latin, meaning “coal-bearing.” In the United States, the Carboniferous Period is commonly divided into the Mississippian (Early Carboniferous), 360 to 325 million years ago (mya), and the Pennsylvanian (Late Carboniferous), 325 to 286 mya. During the Early Carboniferous (Mississippian), limestone's, shale's, sandstones, and evaporites were deposited in the shallow sea that covered most of North America. 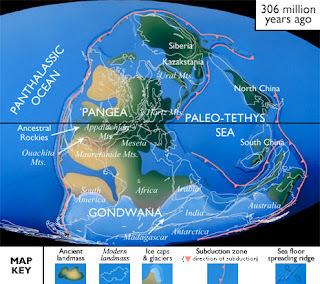 The highlands along our modern East Coast were being eroded until the Late Carboniferous (Pennsylvanian), when North America started to collide with Gondwana. The collision uplifted the ancestral Rocky Mountains, the Ouachita Mountains of Oklahoma, the Appalachians, and much of present-day eastern Canada and the East Coast from Maine to Alabama.